Yellow Mountain Green Tea is naturally extracted using only the finest quality Green Tea leaves available. Our Standardized True Spectrum extract provides active levels of polyphenols, concentrated in the balanced ratio nature intended, without isolating, fractionizing or using toxic solvents, harsh chemicals or gases. Our Green Tea is imported from Anhui province in China where natural mists from the Yellow Mountains envelop the tea plants and provide a superior environment for growing the finest quality Green Tea in the world. 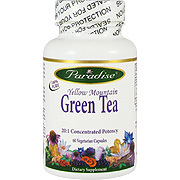 Studies show Green Tea exhibits powerful antioxidant and revitalizing properties. It also helps support a slim and healthy figure. The tea plant has been used for more than 5,000 years in China where it originated. Green tea is unfermented. The leaf buds and young leaves as found in Yellow Mountain and Yunnan make the best tea. The fresh leaves are slightly steamed and then quickly dried to prevent enzymes in the tea from breaking down nutritous substances called polyphenols, which are the cancer-fighting compounds in green tea. Polyphenols are better antioxidants than vitamins C and E. Population studies show that there is less cancer in countries where people drink green tea every day. Grean tea's cancer-fighting effects work best against gastrointestinal, lung and breast cancer. Black tea does not have the same effect due to the fact that it has been oxidized. Drinking Green tea daily has many health benefits. It is an important preventative against elevated blood fats, hardening of the arteries, dental decay, gum disease and cancer; as an antimutagenic, it block the interaction of tumor promoters and inhibits estrogen interaction with its receptors, beneficially affecting breast and prostate. It can help ward off fungal, bacterial and viral infections. It is beneficial for digestive disorders as it inhibits pathogenic bacteria associated with digestive infections; increases probiotic activity and helps regulate bowel function. It may help improve thinking and eyesight. It strengthens arteries and reduces excess fats in the blood. It clears phlegm from sore throats and neutralizes poisons. The tannins in Green tea can help stop diarrhea and inhibit flu viruses. 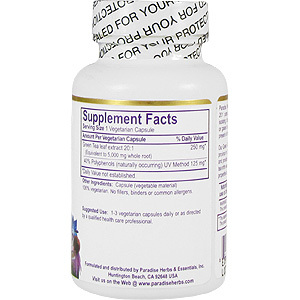 It has been shown to help burn fat, maintain a healthy metabolism and promote weight loss in obesity. It is recommended as an alternative to coffee, black tea and harsh stimulants. 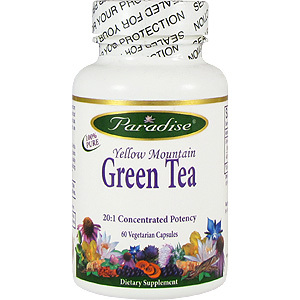 Yellow Mountain Green Tea - is shipped in a discrete, unmarked package. Orders are processed immediately and usually take about 3 to 5 working days to be received. We do ask that you try it for 2 to 3 weeks to feel the full effects. Any information received is used only for order processing and shipping purposes. Your information, such as e-mail address, will never be disclosed to a third party.